Serene, comforting, lush. A beautiful urban oasis that I would gladly stay at again. 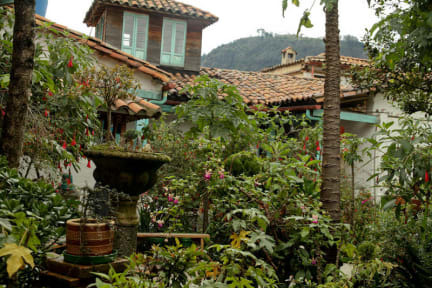 This calm and beautiful place was our favorite in Colombia. A zen kind of vibe, delicious breakfast, amazing gardens, cosy rooms, yoga mats to borrow, lovely bathrooms. Lots of good restaurant options nearby, close to main museums. Only downside is that rooms are very cold and there is no hot water in the bathroom sink (the showers do). But there are a ton of wool blankets to compensate! This is definitely not a party hostel, but a perfect place to relax. I loved, loved, loved staying at Anandamayi. It truly is a magical oasis of peace and love. The energy and atmosphere of this place is pure and inspiring. I met so many lovely people here during my week and a bit stay. The staff are friendly and helpful and the owner very gracious. This is the best hostel I've stayed in during my 3 years wandering the world. I cannot recommend it highly enough! Great clean, quiet spot to rest and relax after exploring the city. Great hot water! The courtyards with tons of plants are beautiful. Love this hostel!! Little piece of heaven. So beautiful and peaceful, right in the centre of la Candelaria. Nice showers, nice breakfast. Heads up, staff don't speak English. 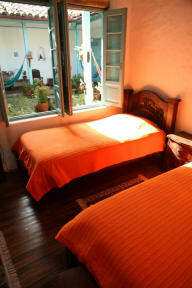 A really nice and quiet hostel in La Candelaria. There weren't many people when I stayed (mid January) and it's definitely not a party hostel but if you want somewhere peaceful to retreat to after exploring Bogota this is a good option and good value for money. There are nice patios to relax and different types of tea available in the kitchen during the day. Just be aware that the street the hostel is on can be very deserted at night. A nice, quite hostel with lots of vegetation, fresh coffee, tea and hot water available all day. The building is early 20th century colonial construction with abundant natural lighting. There is hot water in the showers, but no hot water in the sinks. I was there in the winter when it was relatively cold outside, so having no heaters in the room and bathrooms openly exposed to the outdoors was slightly uncomfortable. A beautiful, quiet spot. I'm in my 20s, many of the other guests were a few decades older than me. There is a social atmosphere but it's more chatting in the kitchen over a cup of tea rather than pub crawls and beer pong. Gardens are beautiful. The courtyards looked lovely and the place was spotless. However, the rooms were really cold and with no heater. Strange rule where women and men had to sleep on opposite sides of the mixed dorm. Staff spoke no English and weren’t very helpful with advice. We didn’t pay the ‘optional’ tip and one lady wouldn’t make eye contact with us after... awkward atmosphere. Lovely place but we got locked out at around only 11pm or so. Had to find another hostel to spend the night in. We had none of our luggage with us that night. Scary and frustrating time. Thankfully was given discount for our troubles and the desk person was genuinely apologetic.